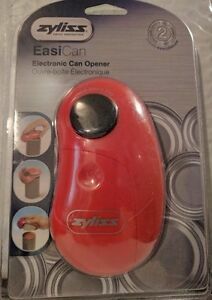 Zyliss EasiCan ELECTRIC CAN OPENER Leaves No Sharp Edges One Touch Start Stop!!! Red and flashy but, trashy. You see them on t.v. and they look like the answer but, they're not. They jam up and take a lot of prodding to open a can. I finally bought a regular electric can opener and have learned my lesson. I'm sure there must be a quality to this product but, I didn't find it. 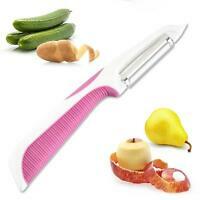 Great can opener, this is a gift and I have one I have used for 3 years. Like the size for easy storage. 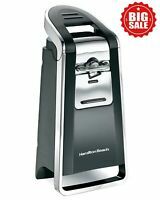 This can opener is amazing. Works as well as it claims....easy peezy! No more can opener on my countertop ...love it! It is a great product. I love that you can push th E button after you use it to have the can separate from opener. Love it!!! As a can opener it does an excellent job. But be careful when you put it away as the on/off lever sticks up and if you put it away upside down or put something on top of it, it will start running and use up the batteries.